SUNDAY, Oct. 12 (Health.com) — About one in seven men has a combination of genes—one new and one first discovered in 2001—that increases his risk of male pattern baldness sevenfold, compared to men without the combination. It’s a scientific finding that won’t grow hair on your head. But it could lead to better testing for a susceptibility to male pattern baldness, a problem that vexes about 40 million men in the United States. Two independent research teams made the discovery, and both teams published the information Sunday in the journal Nature Genetics. They found that certain variations in a chunk of DNA located on chromosome 20 appear to increase the risk of male pattern baldness. However, this DNA section doesn’t have a clear link to hair or skin—so they’re not sure why it affects hair loss. 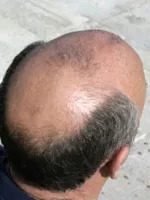 The researchers also confirmed that a second gene region, first discovered in 2001, is linked to male pattern baldness. That gene, found on the X chromosome, affects the androgen receptor, which binds to male hormones. Overall, 14% of the (mostly white) men who were tested had variations in both gene regions, and those men were seven times as likely to have male pattern baldness as men who didn’t have both of the so-called risk variants, according to a team led by Tim Spector and other researchers at King’s College London. The finding could help explain female hair loss too, she says. Women with the chromosome-20 variations were at greater risk of hair loss, but the link was not as strong as it was in men. Next: Should you be tested for baldness genes? There are already home test kits available that can be used to determine if you carry baldness-related changes in the androgen receptor gene, says Paradi Mirmirani, MD, a dermatologist in Vallejo, Calif.
“[But] it was clear that the androgen receptor was not the whole story—many men without this gene variation still had male pattern baldness," Dr. Mirmirani says. There are probably many genes waiting to be discovered that play a role in balding, experts agree. However, better testing could help identify men who could benefit from early treatment with available hair loss treatments, such as minoxidil or finasteride, says Dr. Mirmirani. Hillmer’s research team found that the chromosome-20 risk regions varied in populations—from 3% in the Papuans, who live in New Guinea, and 86% in the San, a South African tribe. It’s even found in 35% to 60% of East Asians, a population that is less likely to develop male pattern baldness than other groups. "The chromosome-20 variant does not explain this,” Hillmer says. Dr. Mirmirani does not currently recommend that patients use home tests for the androgen receptor hair-loss gene. Any genetic testing would need to occur as part of a thorough medical evaluation to eliminate the other causes of hair loss, she explains. One study was funded in part by GlaxoSmithKline, deCODE Genetics, the Wellcome Trust, and other groups. My hair is thinning. Is there anything I can do?